The People Page contains information pertaining to an individual and their family. There are several sections: the Business Card section; Family Members sidebar; Tabs; Toolbar. If a picture has been uploaded, it will display in this section. Anyone with Edit role can upload a picture. Also, My Data users can upload their own picture. Click the address for links to a map or driving directions, which are turn-by-turn directions from the church. In order for the driving directions to work properly, the database must have StartAddress in the Administration > Setup > Settings with the church’s address as the Setting value. An individual can have a Personal Address as well as a Family Address, with one marked as preferred. For those who receive mail at a PO Box, but want to give you their physical address, use the Mailing Address Extra Value feature. Click the email address to open a new mail message using your email program, such as Outlook. You can also email an individual by using the Email function from the Blue Toolbar, just as you would for a group of individuals. Each person can have a Primary Email address and a Alternate Email address. If both fields have good email addresses and both are checked as Active email will be sent to both addresses. If the person has just one email address use the Primary Email field and make sure it is checked as Active. If the church database has multiple campuses, the Campus displays on a blue badge under the person’s name and address. You can edit the Campus by clicking the pencil icon. This also displays as a blue badge under the person’s name and address. Click the pencil icon to edit. The standard positions are Primary Adult, Child, and Secondary Adult. This green badge displays the person’s current church member status. These display based on the status flags in Administration > Setup > Settings and are based on special saved searches. Click here to send emails or text messages. Click here for reports and exports. Click here to do more things - add to tag, create tasks, etc. The toolbar on the people page is used for the same functions as everywhere else in the database. All the members in this immediate family are listed on the left side of the people record. If the list is not showing, click the blue circle with the arrow to open that list. The list displays a small photo, age, member status, email address, and position in family for each family member. An asterisk beside the name indicates this person is the spouse of the person you are viewing. Click a specific family member in the list to view the record for that individual. Click the Family Members heading to Convert to Search all the immediate family members. Under the Family Members section is the section for Related Families , along with the description of the relationship between the families. If the list is not displaying click the blue circle with the arrow to open the list. Click the Related Families heading to Convert to Search all the individuals in the related families. That will include the immediate family you are viewing. If a photo has been uploaded, it will display below the related families. Click Upload Family Photo to upload a picture of the family. This functions like it does for an individual photo. Each people record has tabs with more information. There are sub-tabs for all except the Personal tab. Record Added Date/Time and, in parentheses, the User Id # of the person that created the record. That ID # is a link to that user’s people record. For records that are created during the course of an online registration, the user ID # will be 0. This is also true for records imported from another church management system during conversion to Touchpoint. That is because a specific ‘user’ did not create the record within Touchpoint. Current: A list of organizations in which the person is enrolled with links to the organizations and leaders, Member link to Member Dialog box (which contains information about their membership in that organization), an attendance string (which is also a link to the attendance detail page) as well as their Attendance Percentage, when applicable. Previous: This is similar to the Current tab, but lists those organizations in which the person was previously enrolled, along with their Join and Drop dates. Pending: This is used during Promotion or when forming Committees as a ‘staging area’ for enrollments; also contains links to those organizations listed. Attendance: This is a chronological list of each meeting the person has attended, with links to both the specific meeting and the organizations. This grid also displays a column for the person’s AttendType (Member, Leader, Offsite, In-Service, New Visitor, etc.) as well as Other Attends (indicates if they attended another class or were off-site). Registration: This has updated information from latest on-line registration or check-in, as well as a list of Previous Registrations. This is also where you can manually enter Allergy information, Emergency Contact info, check boxes for Custody Issues and OK to Transport. On standard Check-In labels, codes are used to indicate these: A = allergy; C = custody issues; T = ok to transport. If you are using Mission Trip online registration, this is where the link will be for Emailing Supporters and tracking their balance. Click the small arrow to display more information for an entire group of organizations or the small i icon to display more about an individual organization. Member: Decision, Baptism, Join, Drop, Church Membership, New Member Class - with dates, types, status as well as the person’s Contribution Statement type (Joint, Individual, None) and their Envelope Preference (Joint, Individual, None) and Notes relating to membership (tracking when a church letter was requested, date received; text for notes related to church membership). Documents: This is where you can upload and name any documents relating to church membership. Comments: You can record any comments received on a guest registration card. These comments display on the Inreach / Outreach Forms. Extra Values: There are either Standard Extra Values or Ad Hoc Extra Values . These will vary from church to church. Family Extra Values: These are Extra Values that, when added to one person’s record, will display on the record of each family member. Entry: This is information captured when a person first has contact with your church, usually received when the person first visits the church and completes a guest card. Contacts Received: This is a list (with links to the details) of Contacts this person has received. Contacts Made: This is a list (with links to the details) of Contacts this person has made to others. Tasks About: This will be a list of any Tasks that have been assigned to someone else that are about this person. Tasks Assigned: This will be a list of any Task this person has been assigned. Volunteer: This tab will show the levels of approval for volunteer service, as well as the approval date. There is a Manage button (requires Application Review role to view), that opens a page for Volunteer Application Information. This contains a text box for comments to track the application process as well as a feature for uploading scanned applications. 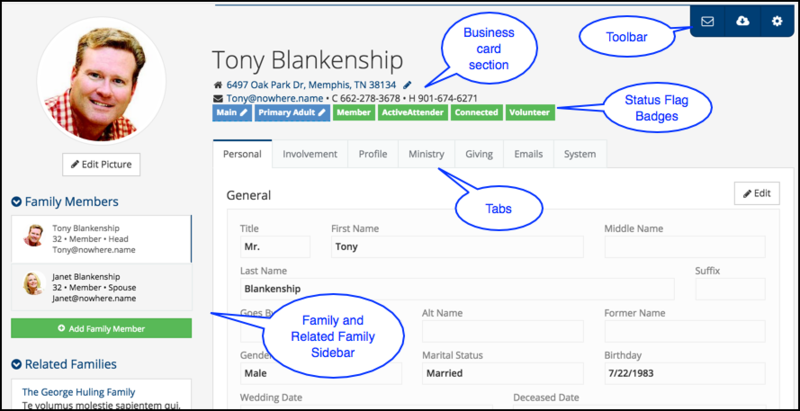 The Ministry > Volunteer tab Management page is also where you can request a background and/or credit check if your church is using our integration with Protect My Ministry. This tab is only displayed for a My Data user (for their own record), and for users with Finance role. It opens tabs for Contributions (displaying a list of individual contributions the person has made) and Statements (where the user can download statements and manage statement and envelope options). Received: This is a list of all emails this person has received. Only users with Admin or Manage Emails can view the entire list. Other users can view Received Emails if they were either the sender or another recipient. Click on the Subject to view the email details. Sent: This is a list of all emails this person has sent. The same visibility rules apply as for Received. Transactional: These are all of the email confirmations and notification type of emails. Scheduled: These are emails that the person has scheduled to be sent at a later date. Optouts: This will list any email addresses for which this user has Unsubscribed. This is also where a staff user can manually add an email address to unsubscribe the person from that address. Failed: This will show any emails that did not get sent to the person due to a Spam Report, a Bounce, or other reason. This tab is only displayed if the Resources feature is enabled on the database. When enabled, the tab will display resources available to the user, organized by resource type and category. User Account: If the person is a TouchPoint user, this will display the username and their assigned roles. This is where an administrator can manage their roles, and change their password, if necessary. Changes: This is a tracking of changes made to personal and family information. Duplicates: This will list any possible duplicate records. Once you identify a duplicate, you need to merge the two records. Merge History: This will indicate that another record has been merged into this one.